South East Queenslanders don’t realise how fast our region will grow in population within the next two to three decades. It is easy to forget when over the last five years, SEQ has had a “lull” in population growth. Ironic because the “lull” is still a growth rate of +1.75% or +56,111 per year according to ABS data (that is roughly x1.5 Greater Springfields added per year). That growth rate is now back up to around the ten-year average rate of 2.2%, or +72,845 people for 2017 (expected to surge again this year). So if you think that our region is experiencing growth pains now, let’s imagine what it will be like in 20 years, when 1.5 million more people or a city larger than Adelaide is plonked inside of SEQ. Now, at this point probably 40% of people are thinking “we can’t keep growing like this”, “we can’t handle the growth”. The truth is, yes, if we were to say ‘do a Sydney’ and leave it to the last minute to build infrastructure that was needed 10-20 years ago, we literally would have the world’s longest permanent traffic jam on the M1 from the border all the way up to the Sunshine Coast. Australians do have faith in our government – this is what makes us different. We are a more socialist left-leaning country (when weighed on a global level), which affords us the usual benefits of universal healthcare, government-funded university degrees, long service leave, four weeks annual leave etc the list goes on. We forget that these are luxuries that other counties do not have, and the reason we have them is because of us, our culture, who do inherently trust our government to apply solutions to the bigger problems in society. So when it comes to infrastructure problems, in Sydney’s case, the government is responding with record investment, however probably a bit later than they should have. In the case of South East Queensland, similar to Sydney, our biggest problem that we face is mobility around our region. As we densify and grow, more cars will be added to roads, and, as we know building more roads actually generates more traffic thanks to the induced demand conundrum. M1 Gridlock between Brisbane and the Gold Coast. Source: Gold Coast Bulletin. Picture: Mike Batterham. In February last year, a Transport and Main Roads spokesperson confirmed to the Gold Coast Bulletin that the M1’s “stable flow”, meaning speeds that are stable and not congested is about 170,000 vehicles per day. TMR have put the M1’s figure for 2017 at 144,437 vehicles per day with estimates revealing that the M1 will indeed reach its capacity of 170,000 vehicles per day by 2020. So, what now? do we duplicate the monster that we have created so that we can have ten more years of “stable flow” traffic until we run into the same problem down the line? or should we innovate? The much-discussed Hyperloop technology, whereby a vacuum sealed tube carries a ‘pod’ at plane-like speeds has been debated across the globe as one possible solution. Hyperloop definitely has a place in the world, and even Australia. It is an experimental technology which will no doubt be perfected to become a vital future mode of transport. While hyperloop is said to work very well for long distance travel, it doesn’t really make sense for medium distance travel, say within SEQ and that is purely due to capacity constraints. An actual Hyperloop has not yet been built, however, the capacity of a proposed LA to San Fransisco hyperloop is predicted to be around 840 passengers per hour. The capacity, unfortunately, is just nowhere near where it needs to be to carry the sheer volume of people required to truly make an impact on region-wide mobility improvements within South East Queensland. Let’s paint a picture, imagine a connected SEQ region, with the ability to get from Brisbane to the Gold Coast in under 10 minutes, 80 kilometres away. Effortlessly floating across a landscape at 400 kilometres an hour, not having to worry about where you parked your car or the mountain of money you just paid to park it there. British designer Andreas Vogler has come up with a double-decker high-speed train concept design called AeroLiner3000 which would carry a whopping 1,400 passengers in one single train and travel 400kph. To put this into perspective, this sort of capacity would serve SEQ’s future growth for many decades to come. There is no doubt that High-Speed Rail (HSR) linking South East Queensland cities would be expensive – of course, it would. If we applied old and current ways of building infrastructure to something like a SEQ HSR, the dint on the public purse would be forever frowned upon. New governments would come and go and blame each other for “gross overspending”. But what if there was a fairer way of not only sustainably funding and then building a high-speed rail network for SEQ but also concurrently solving housing and accommodation issues for the next 50+ years? Located between Brisbane and the Gold Coast is massive amounts of sugar cane land that has been rightfully locked away from development by the Queensland Government. The area around the Norwell Valley between the M1 and the Southern Moreton Bay Islands has purposefully been zoned outside of SEQ’s urban footprint so that we don’t become a Los Angeles of endless low-density urban sprawl. An urban footprint that unlike Melbourne’s footprint, has actually been relatively adhered to and protected. 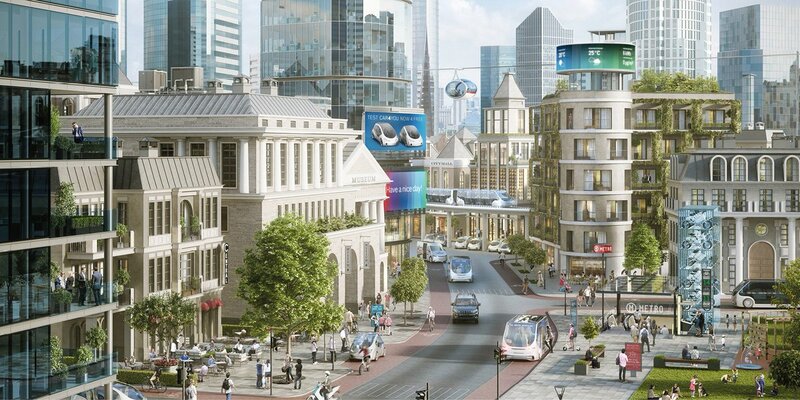 The words ‘smart city’ is thrown around way too much, but what if we could indeed create a genuine car-free, ‘smart city’, one that would only be serviced by a new HSR system and mass transit? Fernando Romero, a Mexican architect conceived a concept prototype city known as FR-EE city. A hexagon shaped, car-free city based on a grid road layout. The concept city would be an 8-minute walkable city, serviced by trams and cycleways. If successful, similar future smart cities could be established between Brisbane and the Sunshine Coast as well as between Brisbane and Toowoomba, linked by high-speed rail. And here comes the “controversial” bombshell – a city developed wholly by the Queensland Government. Queensland Investment Corporation (QIC) was established to make business investments across the world to drive and inject profits back into the Queensland Government, which in essence goes to pay for vital and essential services. A hypothetical ‘Queensland Development Corporation’ which could sit under QIC control and similarly run like a private sector company, could also fully develop and carry out a master-planned smart-city, giving the government full control, but more importantly, collect all associated profits from development which it would use to pay off the High-Speed Rail system as well as other city infrastructure. Developments would be staged and built to meet market demand, whether that be in the form of much needed affordable housing, luxury developments, future tourism parks etc. It sounds far-fetched, but is it really? In case you’re wondering why Alpha Centauri? Did you know that Brisbane is the only major city in the world to be named after an astronomer – Sir Thomas Brisbane? Alpha Centauri also being a binary star system (two stars – two major cities), and also because it just sounds cool – good for marketing and attracting people. To avoid all-out gridlock, which will get worse in South East Queensland, we need to look towards an alternative solution to properly connect the region. A solution that would allow the government to build High-Speed Rail infrastructure and reap the benefits from associated development. Stage 1 high-speed rail station directory concept (Brisbane – Gold Coast). Establish the Queensland Development Corporation (under the control of Queensland Investment Corporation) in preparation for carrying out a citywide development plan. Repeat formula north to the Sunshine Coast, west to Toowoomba as well as other parts of the state. We punch above our weight. The population of South East Queensland is expected to soar to 4.9 million people by 2036. It is vital that the government takes a serious look at High-Speed Rail and different funding methods so that we can avoid an infrastructure nightmare which is currently being felt by Sydney. We can do better. This writer seems to be totally unaware of what is going on on the Sunshine Coast. There is a NEW CBD being built at Maroochydore. The land is an old golf course and is owned by council. We would do everything you mention in the article right now and run the train from Brisbane CBD up to say Petrie (home of the new University of Sunshine Coast Brisbane campus) to Caloundra West (stopping at Aura Central, new city of 50,000), possibly then to the new Hospital and finally ending at the Maroochydore CBD. There is a much higher need for this transport on the Sunshine Coast which has a very slow old train. The Gold Coast has a pretty decent train now. Interesting…but it may have to be a floating city because by the time it’s built Norwell will be under water. This begs the question, who is to be serviced by the touted high-speed rail ? Those cars you see in jammed on our highways are not going to or from the CBD, they bypass the CBD on the way to and from work places outside the CBD. CBD centric transport solutions from yesteryear are not the answer. Simple question, how would building a super city in Norwell (Alpha Centuari) solve the problem of congestion on the M1, which conveys traffic from Tweed Heads to Brisbane and onto the Sunshine Coast via an already congested Gateway Arterial Road? How would building a rail system that is still based upon the old method of Rail over land, which history has shown us would be subjected to the same constraints and problems, as those experienced today, that is, heat related problems affecting signal junction boxes, rails warping, breakdown and power failures. If indeed you are considering the future and alternate methods of transport, why don’t you look more intensely at alternatives to the rail system, like Sky Way for instance. Cheaper method of construction, eco friendly and already had successful trials. Can move people either short or long distances at 150Klm or 500 klm. Better and safer than the Loop system mentioned herein. I agree. Sky Way must be considered. The Silver Bullet will most certainly be a great solution for the commuting from Brisbane to Gold Coast and back. I hope it will happen sooner than later. I have an experience travelling by bullet train in China 10 years ago. At the same time here in the very well developed Australia it takes still 3,5 days to travel from Sydney to Perth. But I’ve seen on TV how proudly were we told that there is going to be a new metro in Brisbane. But the Brisbane airport still 1 hour 50 minutes away from Gold Coast (Helensvale) and by the new timetable it runs not every 20 minutes but every hour. A typical “Lenin road”: one step forward, two backwards. BTW in Europe there are metros everyvhere for about 70 years now. The first Hungarian little metro call as “The Milleneum” was introduced in 1900, i.e. 118 years ago. I have nothing more to say. Substitute high speed for high frequency and you have a better solution. The fastest trains in the world need enormous distances and time to reach their top speeds. Additionally, they only achieve these speeds in remote areas with minimal terrain and no interference from local communities (complaining about noise and the like). You also haven’t considered the amount of time each stop will add to the journey. When you include time for accelerating, decelerating, pausing at each station, and navigating densely populated “centres” you’re no where near a 400kph train. There is no point in buying a fast train which will never reach its advertised speed. What Brisbane and, to a larger extent Gold Coast, need is a more connected public transit system which serves each of their surrounding suburbs more completely. It can be subways, trams, buses, bikeways, or all of the above; but each city needs to plan for their residents to have convenient, frequent, and reliable transport options available to their inhabitants.